About a hundred years ago when I was in first grade I had a lunch box similar to this one in the picture. 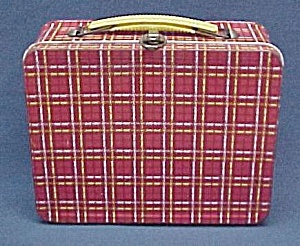 I don’t remember any yellow in it, but it was definitely a red plaid metal lunch box. In the world of school accessories, things like lunch boxes had not become big money makers that are product tie-ins to studios such as Disney. It was just a utilitarian box. McDonald’s had just opened and real people actually ate merely a hamburger and regular-size (i.e., small) fries with an 8 oz. Coke. We were a lot thinner back then. Anyway, that was my lunch box. My mom used the thermos for coffee, so she would tape a nickel or five(!) pennies to the lid so I could buy milk at lunch time. HA! I need a part time job just to keep my teenaged son in milk–I might just try taping some pennies to a lunch box and see how that plays out when he returns to school next month. I had a flashback to those days earlier today when I opened my lunch. I no longer carry around a metal lunchbox, and the contents of my lunch are a little more sophisticated these days: replace bologna with a delightfully rare roast beef–lose the mayo for a spicy horseradish on rye instead of Wonderbread, but the idea is the same. I pulled out my sandwich, and unwrapped the old school folding plastic instead of sealing ziplock, and BAM! it’s 1969 all over again.